↑ 1.0 1.1 Experimental separate build under the name of medusa. ↑ Separate paid app called My OldBoy!. Aims for accuracy, speed, and features. For its accuracy, it's gradually becoming the best at that. It's actively developed and has features VBA-M lacks such as a Tilt Sensor, and more recently Game Boy Camera support. The original GBA emulator. Discovered to have an ACE vulnerability detailed below. A fork with additional improvements. It is behind in terms of accuracy and performance compared to mGBA. A RetroArch fork from an older revision of VBA-M with added speedhacks and tweaks, making it useful for lower-end devices. A bit less accurate in some respects, but fixes a few games such as Advance Wars 2. Its last official version was 0.9. There are, however, two forks of interest: gpSPmod, and gpSP-J. gpSP-J has superior compatibility, while gpSPmod has more options for customization (full screen, cheats, etc). Both are superior to Kai. Its GBA core is cycle-accurate as of v095, but it is behind in terms of performance compared to mGBA and VBA-M.
Has a gba driver markup as working but both graphics and sound are "imperfect". Cheat code files bigger than 1024Kb that you got online from untrustworthy sources. The import code files feature. The old emulator altogether, and settle for other options like mGBA or VBA-M. All of them support the same SRAM save data the cartridge uses. Right: The "Gameboy Colors" mode on VBA-M. Under "Emulation Options", select "GBA Mode". There are four modes. Under Settings > Video Filter, you will find the "Color Emulation" checkbox. Gamma correction and adjusted color range. Cg shaders can be used in OpenEmu or RetroArch that adjust the colors to those of a real GBA screen, as well as other screen types. These are available in GLSL for OpenGL, and Slang for Vulkan. For GBA, there is gba-color.cg, which simulates the color profile of a GBA screen under an external light source more accurately than VBA-M or No$GBA color options. If you prefer the darker color options that those emulators have, then use vba-color.cg instead. There is also nds-color.cg and psp-color.cg, which simulates the color profiles of the original Nintendo DS frontlit screen and the PSP-1000/PSP-2000 backlit screen, respectively. Originally, when saves were implemented, nobody settled on a format, so the Visual Boy Advance devs made its own. Because other emulators often went with raw data, having to exchange different saves caused problems. The original Visual Boy Advance tries to figure out which format a given save is but often fails at it. By explicitly telling the emulator to read it as a specific type using a file called vba-over.ini, VBA complies. VBA-M includes this config file by default, but older revisions like VBA 1.7.2 and VBALink do not. The VBA-Next and VBA-M cores in Libretro have the file baked into the binary so that it can load raw .sav files, but converts the format to its own derivative at exactly 136 KB every time, with save type info contained within the file. This completely avoids the previous issues at the cost of incompatibility with standalone VBA and most others. To solve this incompatibility, Libretro devs created a command-line tool to convert .srm save files made from these cores to raw .sav save data for other emulators. It takes standard input (i.e. just drag and drop the .srm onto the executable) and outputs accordingly. It can also be done in reverse. A 64-bit binary of this tool for Windows can be found here. 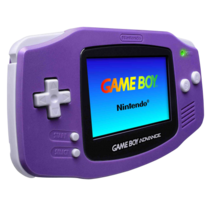 Purple end in GBA means player 1, while a grey end in GBA means P2, P3, or P4. Daisy chaining up to three cables will set up the additional P3 and P4 by connecting the purple end to a purple mid section. This doesn't work with old VBA versions. Just disable "Pause when Inactive", configure all four Joypads each with their own button layout, enable "Link, Enable GBA Link". Now open VBA-M again as many times needed for each player, and have them each use their separate Joypad configuration. Each player will have a separate SRAM save file. Useful if you want to use the Pokémon Battle-eCards. Downloads and instructions reside here. Select "New multiplayer window" from the menu. As you load your ROMs into each window, "Player [X] of [Y]" will appear across the title bar. This can be done for up to four players. However, multiple instances of the same ROM will share a save file. No information about how to get it working at this time, but the functionality also works with DS emulation, and that's how users can check out the incomplete multiplayer Wi-Fi implementation. The wireless adapter has the ability to connect five players to each other and includes its own software to download a subset of another player's game that runs when no cartridge is inserted. Pokémon Fire Red and Leaf Green came bundled with this accessory but it can also work with Pokémon Emerald and the Classic NES Series. No emulator has currently implemented this add-on. The only project whose developers put this on its roadmap is mGBA. The Game Boy Advance can also connect to the GameCube. e-Reader functionality with GC games isn't emulated as of yet, but Dolphin supports connectivity through rudimentary joybus emulation made in parallel with VBA-M. Because this emulator has fallen behind, the Dolphin team is currently rewriting the feature from scratch to better interface with more accurate emulators. They showcased early higan support in a video, but nothing has been released as of yet. Requires VBA-M r947 or newer. Reduce your volume. You won't want it to be high, especially with headphones. Open Dolphin and VBA-M. Make sure neither are blocked by your firmware. In Dolphin, launch the game and navigate to the area where you're asked to connect the GBA. Then, under the controller options, assign the GameCube controllers as "GBA" for whichever you need. In VBA-M, uncheck Pause When Inactive in Options > Emulator. Then, under Options > Link > Joybus Options, Make sure to "Enable Joybus Connection" is on and set "IP/Hostname" to use default settings, that is 127.0.0.1 or localhost. Open the GBA BIOS in VBA-M as if it were a regular GBA ROM. The regular splash screen will stutter a bit. Dolphin should recognize the Joybus Link by then and the GC game will detect that a GBA was connected. To connect other units, open another VBA-M instance and repeat its process. The Legend of Zelda Four Swords Adventures: Both two modes available for the US/PAL version work. The third Japan-only Navi Trackers mode works as well, but the game crashes after the naming screen due to a bug in the GC/GBA connectivity. Billy Hatcher and the Giant Egg: You can download games to your GBA. Amusingly, a RAM dump from VBA-M can be opened as a functional GBA ROM. This device can read content off e-Card paper stripes either as standalone content, or additional content to GBA/GC games. Can be thought of as DLC. Most of these have not been emulated as of yet. There used to be patches that could be applied to GBA ROMs with a utility like Lunar IPS (mostly from No Frills), but they're for the most part lost to time nowadays. Your best bet is to use Action Replay to emulate those. mGBA: In the shortcuts editor, shortcuts can be configured to raise/lower the solar level incrementally or to set any particular brightness level. VBA-M: This emulator uses the keys of the lateral motion controls to change the Solar Sensor levels. You can find those keys and modify them in Options -> Input -> Configure... -> "Special" tab. No$GBA: Under Options/Emulation Setup, you can find the Solar Sensor Level option. You are given the choice between only three brightness levels though: Darkness, 100 Watts, and Bright Sunlight. My Boy! This emulator uses a button combination or the devices light sensor to check the brightness level. You can change this under Settings -> Input -> Cartridge Features -> "Solar Emulation By" menu. Fixes applied directly to the ROM by various scene release groups to make it compatible with any emulator/flashcard, making the in-game brightness level controllable with L+Left/Right. It's argued this makes for a better experience actually, but sadly not all releases are covered. Boktai 1: JP, US, EU. Boktai 2: JP, US, EU. Combinations of Boktai 4 JP with earlier solar sensors to get solar sensor bonuses aren't emulated yet in any DS emulator. VBA-M has an option for Motion controls "Input, Set, Motion". It currently works with all versions of the GBC title Kirby Tilt'n Tumble, which also was a special cartridge with a motion sensor built-in to control movement in-game. But VBA-M does not support motion controls for GBA games yet. VBA doesn't emulate this feature, and its "Motion Control" option (with keys mapped to each tilt direction) covers the GBC title Kirby Tilt'n Tumble. mGBA supposedly includes this feature but key remapping for tilt sensors is not present in the latest builds. Fixes applied directly to the ROM (with the Lunar IPS utility, or at runtime using mGBA or VBA-M and naming them the same as the ROM in the same directory) by various scene release groups to make it compatible with any emulator/flashcard. D-Pad controls substituting motion controls don't work as well here as they tilt it "too much" at times to be very playable. GBC Rumble: GBC games which came on special cartridges with additional hardware for the rumble feature. It was actually used by dozens of releases, and some games like Tarzan 2 GBC were programmed to have rumble support but shipped on regular cartridges. Emulated by VBA-M GX (Wii-only), which also cover the dummied-out rumble games. Not emulated anywhere else. GBA Variable Rumble: Drill Dozer has rumble support, with variable force and speed depending on the rock type you drill through in-game. Partially emulated by VBA-M GX (Wii-only, functional), mGBA has this feature but it's not enabled in current builds. Game Boy Player Rumble: Many regular GBA games, shipped on regular cartridges, enable rumble during gameplay when played on GB Player hardware (which is essentially GBA hardware). These include Super Mario Advance 4, Summon Night Hajimari no Ishi, Mario & Luigi 1, Shikakui Atama wo Marukusuru Advance (both releases), Pokémon Pinball, as well as Drill Dozer which disables its original cartridge rumble scheme and enables this one instead. None of the emulators support this, though it's being under development for the mGBA emulator. Figurine Add-on: Legendz: Isle Of Trials, Legendz: Sign Of Necromu, Plaston Gate (Fix), Plaston Gate DX (Fix). The add-on is essentially Skylanders before it became popular. An obscure medical peripheral designed to monitor a child's blood glucose levels and reward them for keeping tabs on their condition. No known emulator supports this so far, especially given the niche nature of this accessory. Not to mention that Bayer Healthcare destroyed all unsold stock making it hard to find. An peripheral device by Capcom and Takara compatible with Mega Man Battle Network 4 (Japanese edition). It can be connected to the Game Boy Advance and allow the player to transmit real-life toy Battle Chips to the NetNavis in the game. It's also compatible with toy Advanced PETs and Rockman.EXE 4.5 Real Operation. It can also unlock minigames in Mega Man Zero 3.
mGBA (dev channel only) and GBE+ partially support this add-on. This page was last edited on 16 April 2019, at 15:07.